Dos and don'ts about dreaming up new Blood Bowl races. An epic tragedy played out in a rookie match between orcs and halflings. FUMBBL personalities talk about their mummies. Words of wisdom and astute advice. 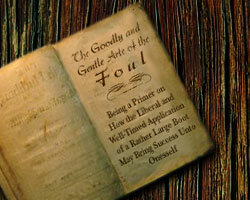 GLN studies the art of fouling. GLN meets the real villains of Blood Bowl: referees. Why fan support is so important for a Blood Bowl team. The secret for a successful recipe to victory for 'flings! The critical art of fouling discussed in detail.